The woodland in Dunwood Park is almost 100 years old and it has as much to offer as the other facilities provided at Dunwood Park. When it was first opened the woodland was sparce and it must have been difficult to imagine how dense it would become. These two images show how the centre of the park looked in 1912 and how it looks today. Dunwood Park is the responsibility of the Council’s Environmental Services Directorate. It is looked after by a team of staff including Gardeners, Landscape Architects, Arboricultural Officers, and Modern Apprentices working their way to a career in Horticulture. These people work tremendously hard in all aspects of the woodland. Among many other things they keep all the paths safe, ensure the trees are healthy and well maintained, mow the grass, plant seasonal flowers, general maintenance of benches, bins as well as improvements on existing facilities. The team can be seen throughout the year working hard in all kinds of weather. Spare a thought for them next time the rain is pouring and the Oldham wind machine is in full swing. They will still be out there making sure your park is as safe and well maintained as possible. This section details three suggested walks that can be enjoyed. It also hightlights, in light blue, the part Dunwood Park plays within the Oldham and Crompton Ways. Click on the title of the walk for more detail. The Green walk is an easy stroll to the bandstand in the heart of woods. The Amber walk uses the main route through the park, but offers a more rugged part through the woods. The Red walk takes in as much of the woodlands as possible and has some steep parts that will offer a good challenge. This walk starts at the car park near the Tennis Courts. It is all on the main path through the park and does not involve any steep parts. From the car park, with the Tennis courts to your right, walk to down to the main path through the park. Here, turn left and enjoy a relaxing stroll through the heart of the park. This will take you past several benches which are a great place to stop and enjoy the sights and sounds of the woodlands. 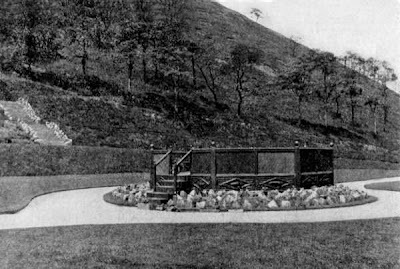 Eventually the path opens out into the bandstand in the centre of the park, which is a great place for a picnic. Here you can turn around, or for a slightly more daring walk, continue along to the end of the bandstand and go up the small set of steps on your left. This takes you onto a higher path above the bandstand and is well worth the effort. Following this path takes you back above the main path until it rejoins the main route. Just after you have rejoined the main path, at the fork, take the right path which takes you up to the top gate. At this point you leave the park, but continue down the hill for a few yards and you can re-enter at the car park. From here you can gently stroll around the tennis courts and bowling green, before arriving back at the car park. The Amber walk - A more difficult walk with some steep paths. This walk, like the green walk starts and ends at the car park near the Tennis Courts. It can be walked in either direction, but here it is described via the harder section first. From the car park, with the Tennis courts to your right, take the path to the left, by the side of the small storage building. Turn left and up the stone steps towards the top gates of the park. Here you will see a small path to the right that leads into the woodland. Follow this path up into the woodland. Eventually a path will appear to your right. Take this path and go down, deep into the heart of the woodland. Follow this path all the way down until it eventually rejoins the main path through the park. Turn right onto the main path and follow this route all the way back to the car park, but perhaps stopping for a picnic or just a well deserved rest at the bandstand. The Red walk - A challenging walk with lots of steep paths. This walk, like the green walk and the amber walk starts and ends at the car park near the Tennis Courts. It can be walked in either direction, but here it is described via the harder section first. From the car park, with the Tennis courts to your right, take the path to the left, by the side of the small storage building. Turn left and up the stone steps towards the top gates of the park. Here you will see a small path to the right that leads into the woodland. Follow this path up into the woodland. Keep on the path as it skirts the upper edge of the woodland, enjoying some amazing views across the valley. Staying to the main path eventually takes you to the far end of the woodland where you turn back on yourself and down some steps. At this point you can either continue straight on and the path will take you eventually back to the top path, or you can continue down the steps until you meet the main path through the park. Turn right onto the main path and follow this route all the way back to the car park, but perhaps stopping for a picnic or just a well deserved rest at the bandstand. From here you can gently stroll around the tennis courts and bowling green, before arriving back at the car park. The woodlands are home to a huge variety of creatures and plants. Many classes from the local schools have visited the woodlands to study and experince these first hand. The woods may seem wild and untamed in parts but they are actually very well tended. Teams work throughout the year planting seasonal flowers, tidying beds and trimming bushes and trees. The animals that live in the forest include rabbits, owls, foxes, ferrets, and voles as well as many others. The woodlands are beautiful but with the help of the Big Lottery Bid we hope to improve them and make them an even more enjoyable experience. The Bandstand will receive some much needed attention and the bankings improved there. 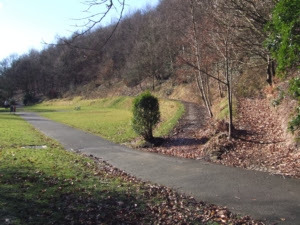 The paths are all in need of some repair work and the upper paths can be slightly dangerous in bad weather. The steps at the Jubillee end of the park that form part of the Oldham & Crompton Ways will hopefully be replaced. Improved facilities thoughout the park will mean the woodlands will be cared for better and more seasonal planting can be carried out to make the most of this wonderful asset.